Most of us know that exercise is important for all aspects of our health, but the idea of getting physically fit, more than just taking a walk at lunch, can seem intimidating or downright unnecessary. You might be thinking, “what kind of exercises would I need to do or how long would I need to exercise and how often”? If I feel fine then do I really need to “Get Fit”? Good questions and challenge accepted. Do you remember the Life Call infomercial where an elderly woman utters the now infamous phrase, “I’ve fallen and I can’t get up”? We may have a laugh over the informercial and think that could never happen to us, but could it? We may feel fine and think we’re fit as a fiddle, because we’re not hampered by an injury and we don’t require any extra help in our everyday lives. However, if you’re beyond the age of 20 and you’re not doing something to strengthen your body on a consistent basis, your bones and muscles are shrinking. To top it off, around the age of 28, your growth hormone starts declining. With every passing year we’re aging faster, that’s why it’s important to maximize muscle mass and strength while we can. Aging may be a force to be reckoned with, but it doesn’t have to win. The goal of this Get Fit Challenge is to be able to independently lift, pull or push your own body weight. Level 1 – For someone who is NOT physically active. Challenge: From a seated position, practice standing without using your hands. Do this 10x a day. Each week add another rep. This will ensure that if you were ever to fall, that you would have the strength to get up on your own. Level 2 – For someone who is physically active but doesn’t practice regular strength training. Challenge: Do one strict pull-up and one strict push-up. For a pull-up, place your hands in a palms-forward position on the bar, pull your body weight up until your chin is over the bar. You can use bands until you’re able to do a strict pull up on your own. Here’s a pull-up bar you can put up in a doorway if you don’t want to go to the gym or bands for an assisted pull-up. 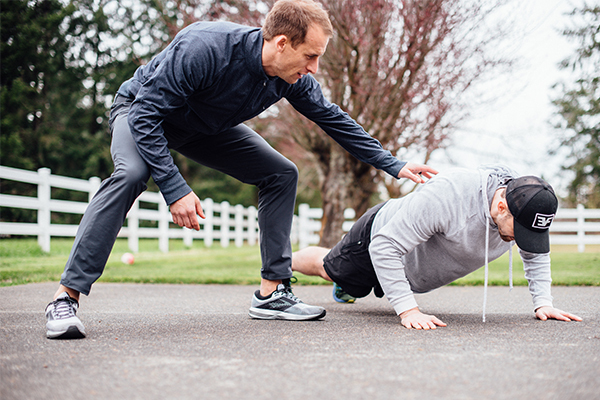 For a push-up, place your hands and feet on the floor and lower your body until your chest touches the floor and then push yourself back up. You want to have enough strength that you could push or pull your own body weight out of a ditch or some other unexpected situation or be able to help someone else out. Level 3 – For someone who is physically active and practices regular strength training. Challenge: Stand with your legs crossed and lower your body into a squat position until your rear touches the floor and you’re in a seated position then stand back up. Switch legs. Do 5 reps on each side. This helps develop balance and flexibility without being dependent upon our hands for support. Did you know that lifelong exercisers have a cardiovascular system that acts 30 years younger than their counterparts who do not exercise regularly? In fact, muscle mass is the #1 biological marker of aging. All cause mortality increases as muscle strength decreases. Sadly, over 40% of a person’s muscle mass will be lost by age 70, if resistance training is not practiced regularly. What is the most efficient way to build muscle? Perform movements to failure or very near failure on a consistent basis. The body is insanely good at adapting to the stress applied to it. If we perform the same activity over and over without applying more resistance or increasing the intensity of that activity, we will start losing muscle and overall fitness. When you’re building muscle, you’re also building strong bones so you can freely move about without worrying about fracturing a bone! Besides strength training, try incorporating simple habits like, putting your shoes on or taking your shoes off while standing instead of sitting or putting your carry-on luggage in the overhead bin. Sometimes you don’t realize that you’ve lost some of your balance or strength until you change an aspect of your routine. These habits can add up and serve as guardrails to make sure you don’t lose your independence later in life. What challenge did you accept? down 30 lbs on Keto + IF. love to start including exercise as a part of what i’m doing. There are SO many types of exercise routines to choose from but which approach is really the best? Can you suggest a workout resource for a stay at home mom with no equipment? Especially like how much time should be invested each day? Thanks!